During May 2007, a salvage excavation was conducted at Sulam (Tel Shunem; Permit No. A-5136; map ref. 231800–25/723518–44), prior to enlarging a residential building. The excavation, undertaken on behalf of the Israel Antiquities Authority and underwritten by the property owner, was directed by G. Cinamon, with the assistance of Y. Lavan (administration), A. Hajian (surveying), M. Hartal (consultation) and laborers from Umm al-Fahm. The village of Sulam is located at the southwestern foot of Giv‘at Ha-More. The tell, situated in the northeastern part of the village, has been identified with Shunem, which is mentioned in the list of Thutmose III and in the Bible. The site had been surveyed in the past (Map of ‘En Dor , Site 37) and numerous small excavations had been carried out (HA-ESI 114:26*; HA-ESI 122). Remains from the Middle and Late Bronze Ages, the Iron Age and the Persian, Hellenistic, Roman, Byzantine and Early Islamic (Umayyad) periods were exposed in the village cemetery, which is spread across the slopes and summit of the tell. The excavation (25 sq m; Fig. 1) at the southern foot of the tell had reached bedrock, which was exposed in the center and northern parts of the area. A thin accumulation of soil (L107; max. thickness 5 cm), devoid of finds, was discovered on bedrock in the northern half of the excavation area. This was overlain with an accumulation of heavy brown soil (L105; thickness 0.83 m) that contained small fieldstones and a mixed assemblage of potsherds, dating to the Late Roman, Byzantine and Umayyad periods (fourth–seventh centuries CE); it points to habitation at the site during these periods. 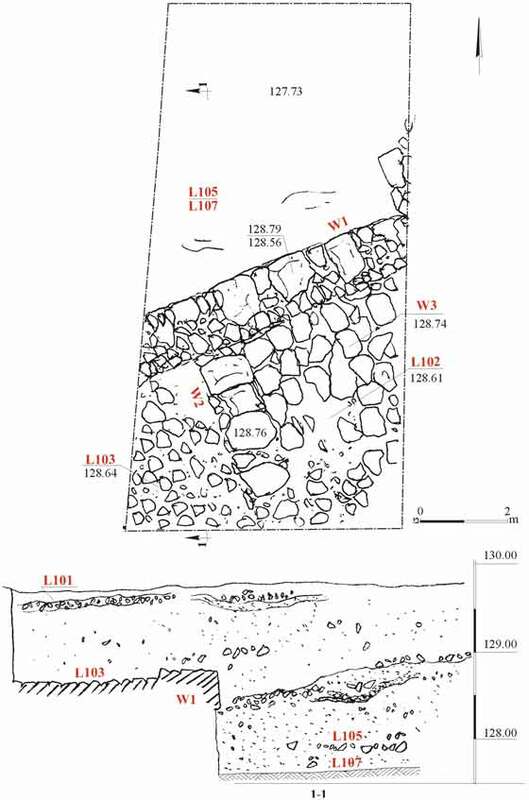 This accumulation extended across the southern part of the area, where a building was founded on top of it.Two of the building’s rooms, paved with stones (L102, L103), were exposed. The continuation of the structure extended below a modern dwelling and therefore its plan remains unclear.The rooms were delimited in the north by a massive wall (W1; exposed length 3.2 m; width 0.7 m), oriented northeast-southwest.It seems that the northern face of the wall, which was built of large meticulously arranged stones, constituted the outside of the building; the southern face was composed of small and medium-sized stones, not set nearly as carefully as the northern face of the wall.The two rooms were separated by a partition wall (W2; exposed length 2 m, width 0.5 m) that was perpendicular to W1.The pavement in Room 103 consisted of wadi pebbles that were set in place very closely together; whereas flat fieldstones composed the pavement in Room 102.At some point in time during the building’s use, three long flat stones (W3; length 1.1 m, width 0.2 m) were apparently placed on the floor in Room 102 for the purpose of partitioning it.A meager assemblage of potsherds, which was gathered from and below the rooms’ floor, was sufficient to date the construction of the building and its use to the transition phase between the Byzantine and the Umayyad periods (mid-seventh century CE). These remains were found covered with modern fill (L101; thickness 0.18 m) that included construction debris, modern household utensils (twentieth century CE) and a few ancient potsherds.